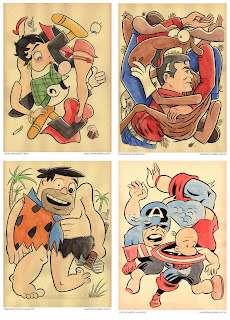 Little Lulu & Wonder Woman, The Yellow Kid & Mr. Natural and Mark Trail & Bullwinkle, all rendered in soft gouache watercolor tones and ink, on austere, pulp-hewn manila paper. show, made available for purchase for the very first time. Response to the enigmatic series has been strong throughout the cartooning community, and beyond. It seems Eaton’s plucky disassembling of such well-loved characters as Mr. Magoo, Charlie Brown, Nancy and Bugs Bunny, has pushed some notoriously opinionated buttons. cartoons as Frank, JIM, and the wonderfully mesmerizing Seeing Things. Feather and co-author of Moviemaking Illustrated: The Comicbook Filmbook. in 1963. He currently lives and works in Seattle, Washington. Sub Pop Records and Nickelodeon Magazine. galleries in Spain, Germany, and the United States. can be found on his small family of art blogs, notably Picture, J.W.E.